Exfoliating your skin will help prevent acne, refine your complexion, tighten your pores and keep your skin looking radiant and smooth. Have you ever walked into a Sephora or a drug store and felt totally overwhelmed because there were SO many choices? Skincare shopping can be intimidating. I tend to get all flustered when I am faced with more than three choices, so unless I know EXACTLY what I need to get I avoid these places. Today I am going to share with you a little secret natural exfoliator that you most likely already own. Baking Soda is the PERFECT exfoliator. It has just the right amount of grain to remove the dead skin cells and give your skin the ultimate glow! I promise you wont be disappointed. 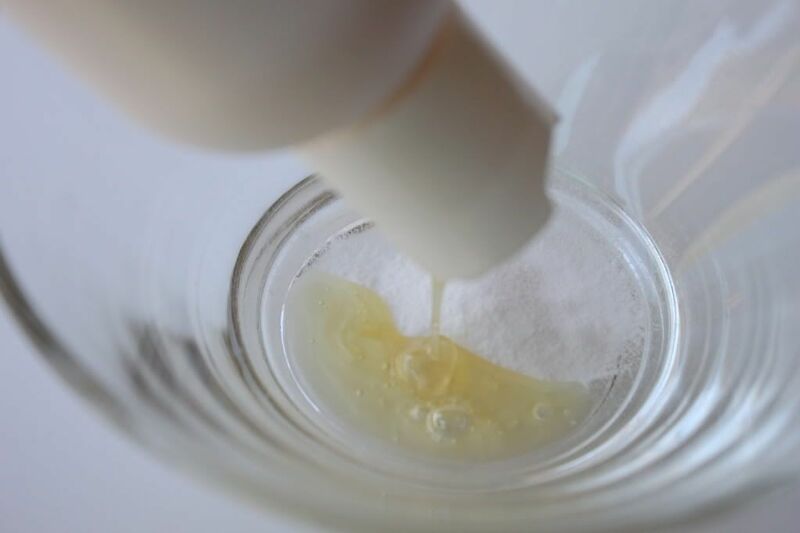 Add a teaspoon of baking soda to favorite cleanser and mix. Exfoliate your face for about three minutes and rinse. Your skin will feel SO soft and refreshed. that is so cool that adding baking soda softens your skin! thanks for sharing! Yes I read this somewhere and I've been doing this for a while. It seems to have some kind of anti-bacterial properties 'cos my skin don't break out so often anymore. Any recipes for making a mask with baking soda? I used to do this a few years ago but forgot about it. Will give it a go tomorrow. Thanks! This is the best advice I've gotten in a long time. So doing it. "..faced with more than three choices.." Great "face" pun. ;) So what's your favorite cleanser for adding baking soda?! The one in the picture? And is baking soda better than sugar, which I've also heard is a good natural exfoliator? I love this weekly post!!! It is seriously so helpful! I definitely plan on trying this. I'm so out of the loop when it comes to skincare! are there any skin types that shouldn't use baking soda? i've heard that before but i remember there being one "exception" and now i can't remember what it was!! yep, this is what i use... if it's to hand. otherwise i let my skin soften in the shower then use a wet terry-cloth towel. it's amazing how easy it is to exfoliate! No need for expensive products at all. Mongs- when I was going through my skincare classes our instructor swore by a mixture of baking soda and water. She used this as a mini mask for those who are prone to acne. Leslie- my favorite cleanser is from a line called Skin Fitness. It's all natural and makes my skin feel so fresh and clean :) Yes you are right, sugar is also a great natural exfoliant...I just prefer to use baking soda on my face...but I do LOVE a good sugar scrub for my body! 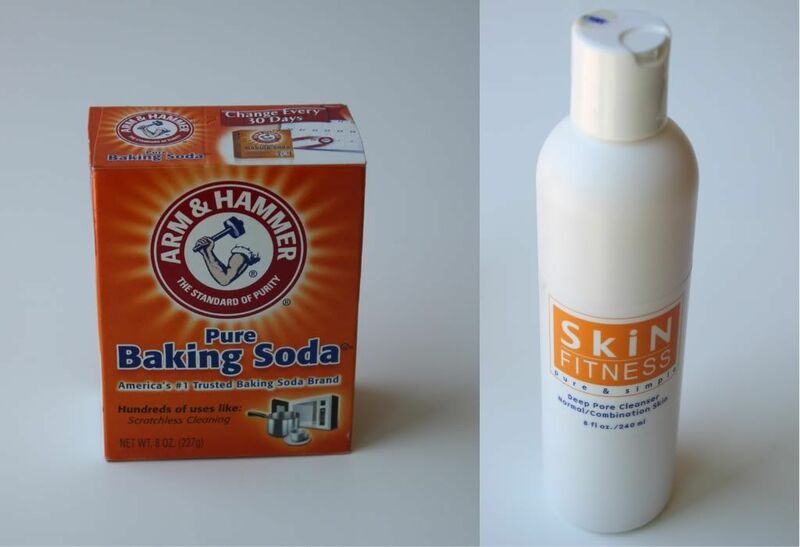 Katie- baking soda is so gentle it is good for almost all skin types, but there is always the exception. If you have severe rosacea or open cut and sores I would hold off. Great skincare tip! I'm going to put it to use. I am a little obsessed with baking soda, but had never heard this tip before. Thanks for sharing. I'm definitely going to do some exfoliating soon. I'm making some serious headway through my Costco-sized bag of baking soda! baking soda is AWESOME!!! i use just straight baking soda on my face once a week, rub it in rinse it off. i have my son use baking soda on his t-zone as he's starting to get a little pre-teen acne. works great for him too! I am soooo trying this idea...and I know for sure I have baking soda..because i ran out while cooking and made the hubby run and grab some LOL! Girl, i just love your tips! Wow, this is a really wonderful tip! I swear, you always have the best tips on here. I don't know how you do it! Thank you for sharing! Wow! Great tip! Thanks for posting it. very cool!!! :) I'm following! Defiantly going to give this a try! Sounds very interesting!!! I have to try it!!! Its sound Awesome. All this skin care tips are such an awesome. I really impressed with your content and The information makes me crazy about it. Thanks for the great skin care advice. Whoda thunk it? I'm so all over this one!!! Loving the weekly tips!! Thanks! I've tried this idea and it's so perfect! I just came across this tip the other day and have started using the baking soda and I love it. I do it about twice a week and I can tell the difference - my face really glows (in a good way, lol). Thanks for sharing. Seriously loving all these tips. Wow, what a great tip! Thank you for sharing! Thanks Lindsay! I knew you'd have a solution! Love all your great tips. How often do you do this? I also have a hydration mask I bought and LOVE, but how should I use both of these in my routine? I am obsessed with your blog now and have my apple chips in the oven. :) Thank you. I've been using this for over a week now and it's great. I use it as a mask and it's gotten rid of my acne. Now I have some redness left and dry skin. Any suggestions? I've been using the mask for over 6 months, but I add 1 tspn of olive oil to make sure that the skin gets moisturized at night and my face is so beautiful. No acne and no redness. Soft and glowy. Safe for pregnant mamas? I've never had acne like this until now and I won't go near any unnatural products while I'm carrying this babe! I'm using your raw apple cider vinegar topical treatment and hoping it works! Thank-you! Was just wondering if this is safe for pregnant ladies and is this something I can do daily or occassionally? Are you adding the baking soda to the entire container of cleanser, or just the small amount you will use at that cleansing? Are you adding the baking soda to the entire container of cleanser, or just the amount you are using at that cleansing? Thanks for the reminder.. I have used it & my skin felt great.. I have purchased mudd for masks..
any diy versions of that ?